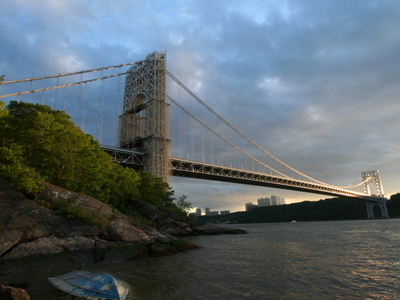 The George Washington Bridge (known informally as the GW Bridge, the GWB, the GW, or the George[not in citation given]) is a suspension bridge spanning the Hudson River, connecting the Washington Heights neighborhood in the borough of Manhattan in New York City to Fort Lee, Bergen County, New Jersey. Interstate 95 and U.S. Route 1/9 cross the river via the bridge. U.S. Route 46, which is entirely in New Jersey, ends halfway across the bridge at the state border. Within the New York metropolitan area, the Tappan Zee Bridge (Interstates 87/287 & New York State Thruway) is an alternative route that avoids the city proper. For longer-range traffic, such as traffic between New England (and points north/east) and Pennsylvania (and points south/west), Interstate 84 which crosses the Hudson on the Newburgh–Beacon Bridge is often used as an alternative rather than either the GWB or the Tappan Zee Bridge, as it avoids the core areas of the New York metro area entirely. 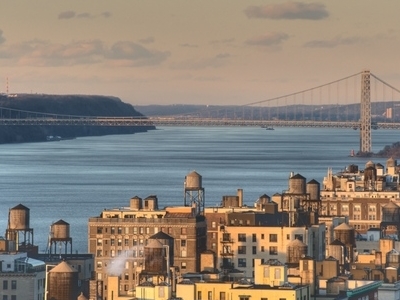 Here's the our members favorite photos of "Bridges in New York City". 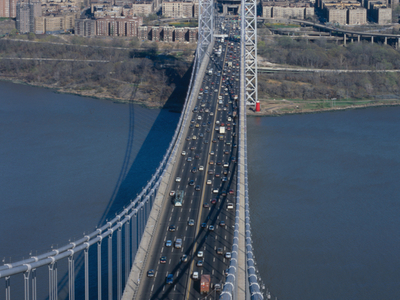 Upload your photo of George Washington Bridge!